WILKES-BARRE, PA. — Former MLB relief pitcher, Sparky Lyle, will be the guest speaker at the Sons of St. Patrick dinner on Friday, March 13, at the Genetti Hotel and Conference Center in Wilkes-Barre. John Corcoran will be the toastmaster. Source: TimesLeader.com. 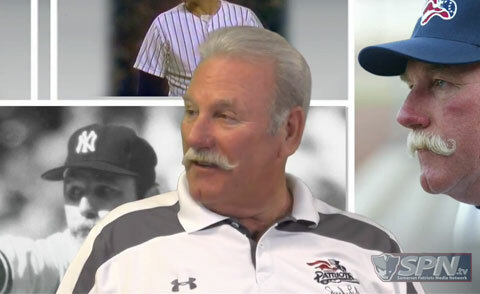 Photo shows Sparky Lyle from a clip from “The Sparky Lyle Show” in 2014 where Sparky is speaking with Paul Spychala about the 1978 New York Yankees and World Series. Watch Sparky Lyle speaking about the 1978 New York Yankees World Series. Sparky Lyle is a retired left-handed relief pitcher who spent sixteen seasons in the MLB from 1967 through 1982. A three-time All-Star, he won the American League Cy Young Award in 1977. He was a relief pitcher for the Boston Red Sox, New York Yankees, Texas Rangers, Philadelphia Phillies, and Chicago White Sox. During his stint with the New York Yankees, Lyle was a member of the World Series champions in 1977 and 1978. Playing Field Promotions is a booking agent for motivational sports speakers and celebrities. If you would like to book Sparky Lyle for a speaking engagement or personal appearance, contact Sparky Lyle’s booking agent for appearance & speaker fees at 1.800.966.1380.